Moon and Jupiter - Solar System Planets And Moons Section. Astrophoto of the moon and Jupiter by Bojan Stajcar. Moon and Jupiter by Bojan Stajcar. Amateur photographer Bojan Stajcar took this picture of the lunar occulation of Jupiter on the 27th of February. This picture was taken 10 minutes after the Moon partially occulted Jupiter, at 11:04 pm local time, from Melbourne, Australia. 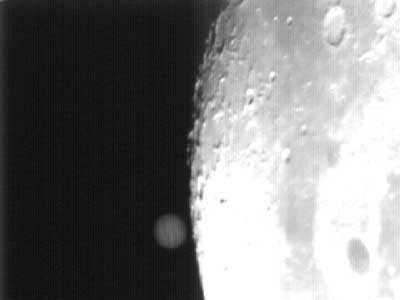 The camera used was a mechanically modified Connectix Quickcam, with 320x240 pixel CCD sensor in the focus of the motorized ("Bartelized") homemade 10", f5.6 reflector. Note the difference in the surfaces brightness of the Moon and Jupiter. Despite the fact that the Moon surface consists of very low reflective material (dominantly basalt), it is brighter, as Jupiter is 5 times further away from the Sun. If you're an amateur astrophotographer, visit the Universe Today forum and post your pictures, we might feature it in the newsletter.